Thanks for posting this info. We are join the cheering and hope they find a cure soon. This is amazing news. Next for the prevention/cure! That is great news and we hope it will be a thing of the past real soon. Good on Dr Whittaker. Have a marvellous Monday. This so made my eyes leaky.. I am so happy they found SOMETHING..
What wonderful encouraging news. We hope that this new knowledge leads quickly to treatments, preventatives and a cure for this terrible disease. That is such great news. WE hope this will translate into helping lots more kitties in the very near future. This is EXCITING news! I look forward to the day when NO kitty should ever have to die because of FIP. Very exciting news....very. Here's hoping this road leads to victory. WONDERFUL!!! Thanks so much for sharing! That is such great news!! When you figure out why something happens it is easier to figure out how to stop it from happening again. What wonderful outstanding news. Maybe one day this disease can be wiped off the face of the earth. FIP is an awful disease and we're hoping this breakthrough leads to the end of it. 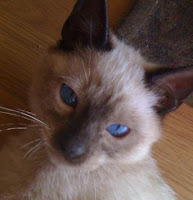 Mom lost her first Birman, Uriel, to FIP. Wow! This is some of the best news we have heard in a long time! Thanks so much for sharing it! FIP is a terrible, heart breaking disease. And once the researchers are successful, they can use the same techniques to treat similar diseases. Feline leukemia would be nice! Thank heaven for this scientist, and here's hoping we soon see an end to this desease! That is a tremendous breakthrough!! Our Dads dear friend in rescue lost one of her ferals very recently to this killer. The fellow was just out of kitten stage and letting her pet him a bit when it struck. Paws up for the good doctor!!! Such encouraging and hopeful news. OMC!! I am so excited by this hope! Mom Linda lost a kitty to wet FIP 37 years ago...a kitten. This is pawsome!